At 6pm on Friday 12th March a bus load of excited ARA members left Ballinasloe for an evening at the Dogs in Galway. Some members were on their 3rd or even maybe their 4th trip so they knew exactly where to go when we arrived. Met by a very friendly staff we were seated quickly and began to check the form of the dogs, not that it made much difference to many of us. We were served a delicious meal. It was hard to concentrate on eating while placing our bets and watching the races but we managed. We had some wins but I don't think anyone made serious money. The journey home on the new moterway was a first. 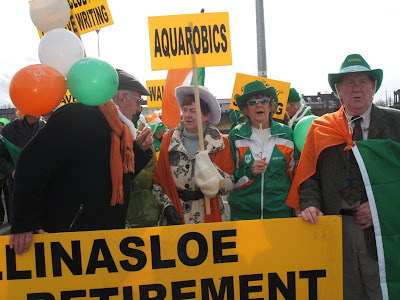 It was a beautiful spring day on March 17th of this year as a group from the Ballinasloe Active Retirement Association took part in our local St. Patrick’s Day parade. Many from our walking group were in attendance together with other members. We paraded in our national colours of green, white and orange and happily waved the Tricolour. To everyone’s delight we took first place in the Voluntary Category. We were so proud to be Irish! Given the blue sky and pleasant sunshine many spectators came out to watch and applaud all the participants in the parade. Afterwards members who would have found the walk too difficult to participate in, joined the victorious members as we gathered in Gullanes Hotel for refreshments. And so another St. Patricks Day celebration came to a close. Monthly meetings for all members : 1st Wednesday of every month @ 3pm in Gullane’s Hotel, Main St. Various courses, Creative and learning programmes and informative talks are arranged throughout the year. Bridge 8pm Bridge rooms Sarsfield Rd. Pitch and Putt (Weather permitting) Creagh training centre, Creagh Rd.